When global sea surface temperature anomaly (SSTA) graphs are presented, we are essentially averaging several unique trends to create one irrelevant one. 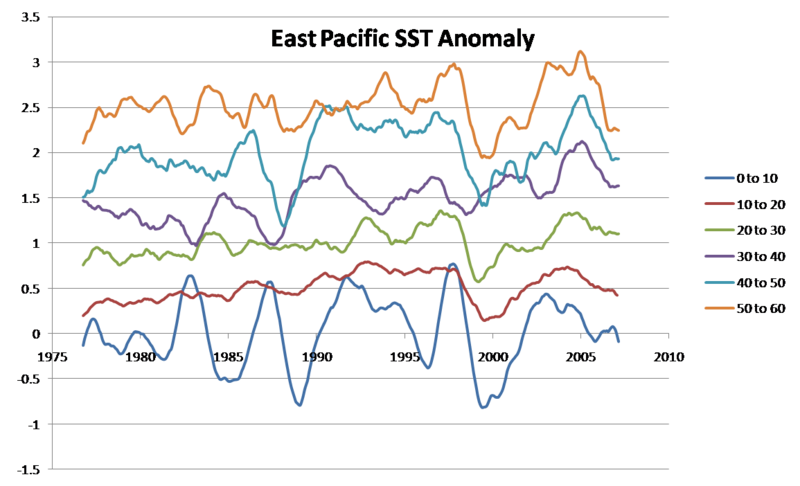 Imagine averaging temperature data from each planet in the solar system from 1900 to the present, and then looking to the resultant average time series to indicate the nature of changes in temperature of the entire universe. By doing this, you have constructed a time series that describes not a single one of the changes seen on any planet. The Earth’s oceans can be thought about in the same way. 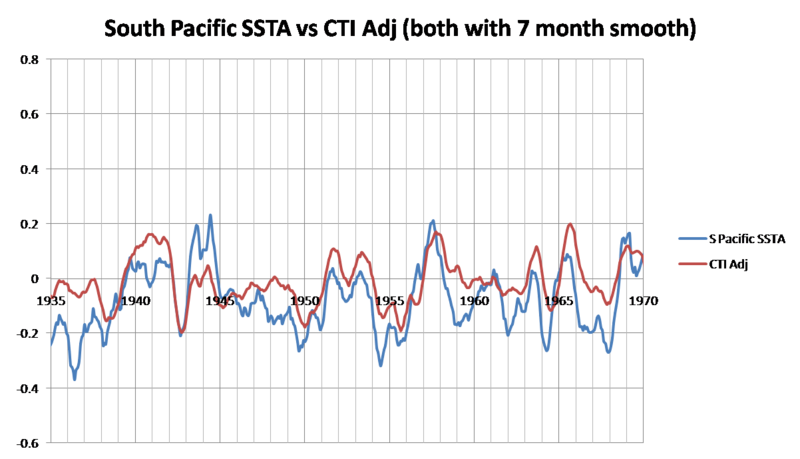 With each ENSO-adjusted graph I present, I will also present a graph comparing the seasonally-adjusted raw SST data against with my adjusted ENSO representation. 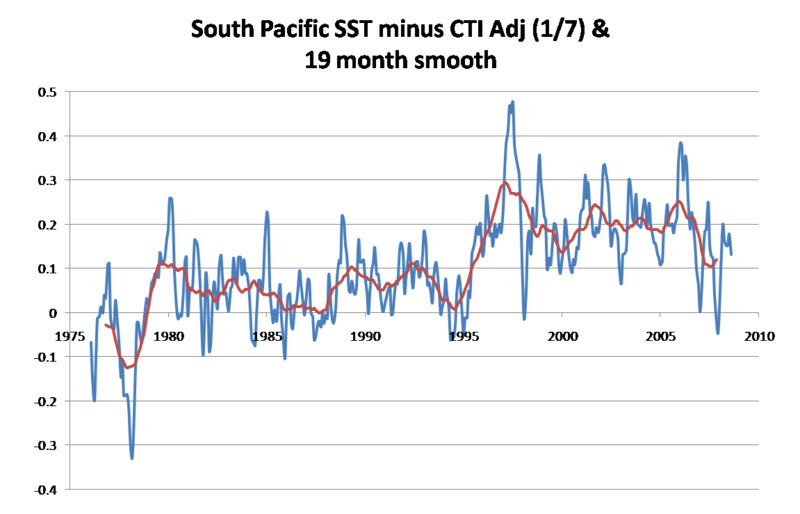 Erl makes the good point that the Southern Oscillation Index (SOI) is closest to the source of variation, so it best describes the phenomenon. However, SST outside of the tropics depends on heat transport from SST variation within the tropics, not variations of the SOI. Therefore, I will use seasonally-adjusted SST data from the Cold Tongue of the Pacific (6N to 6S, 180W to 90W) to represent ENSO, however inadequetly. 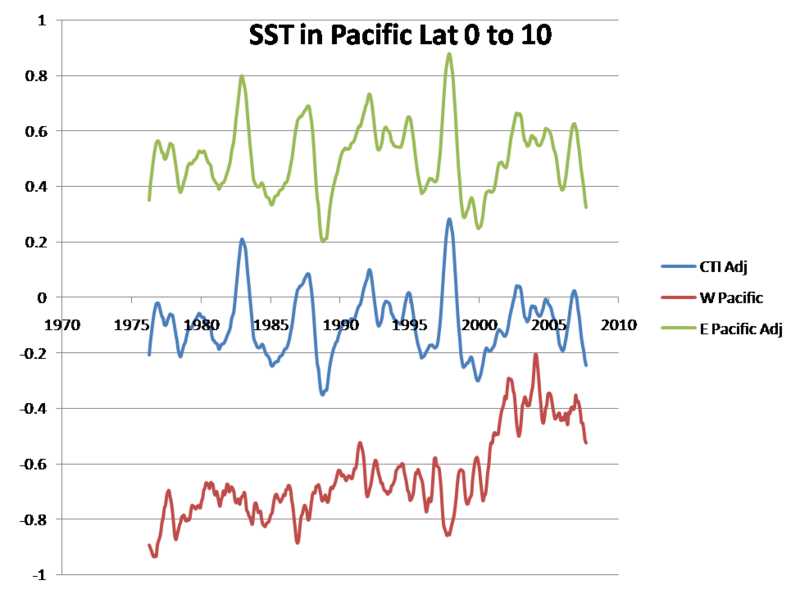 Each ENSO-adjusted graph also indicates the scaling factor applied to the Cold Tongue SST data (ex. 1/7 means that SST anomolies in the Cold Tongue were divided by seven before beng subtracted from the oceanic SST data) and the number of months that SST in that region lags behind SST variation in the Cold Tongue. 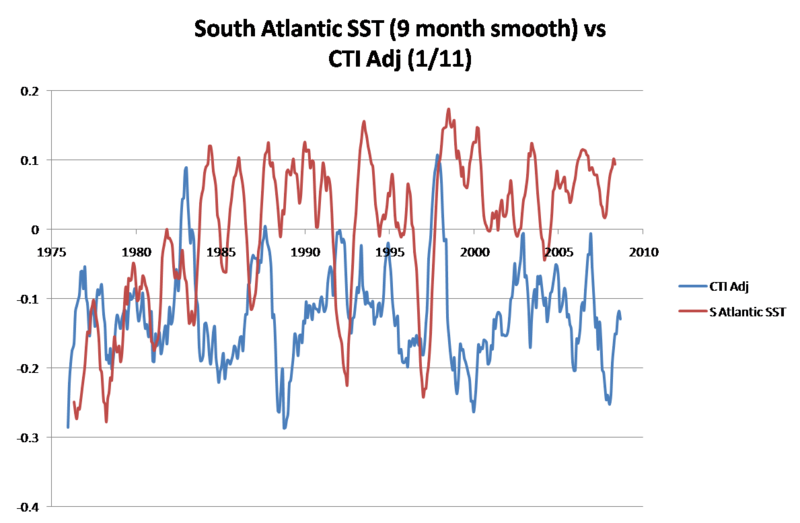 Below is ENSO-adjusted SSTA for each hemisphere. The dip in SSTA in the Northern Hemisphere between 1991 and 1995 was likely due to the eruption of Mt. Pinatubo. I won’t bother discussing hemispheric SSTA because even this simplifies the real variation. I didn’t break down the Indian Ocean by latitude or longitude because I don’t see any mysteries in the trend. 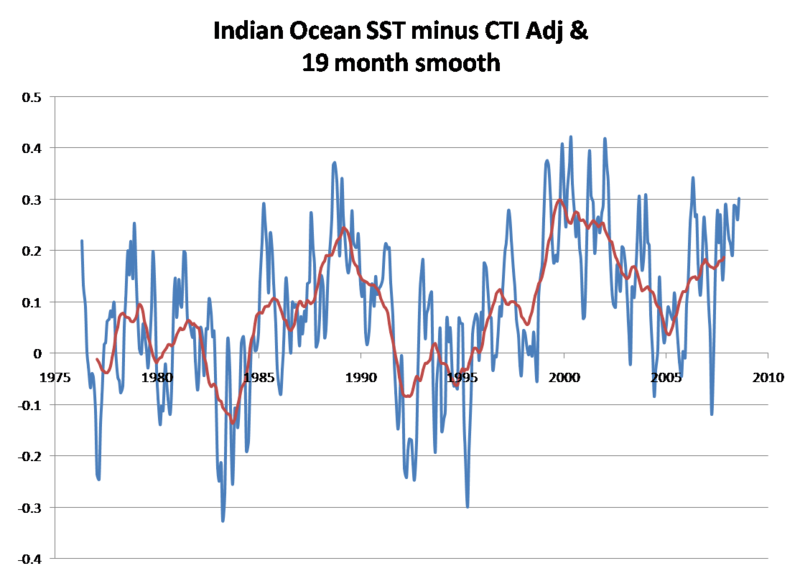 It is apparent that the Indian Ocean responds to strong El Nino events with step changes in the ENSO-adjusted data. However, the elevated temperature does erode over the following years. This took place after the 86/87 El Nino and the 97/98 El Nino. To better see the step change associated with the 86/87 El Nino, look to the first graph. There also appears to to be a step change in 2006. A response to to persisent positive anomaly in the Cold Tongue? 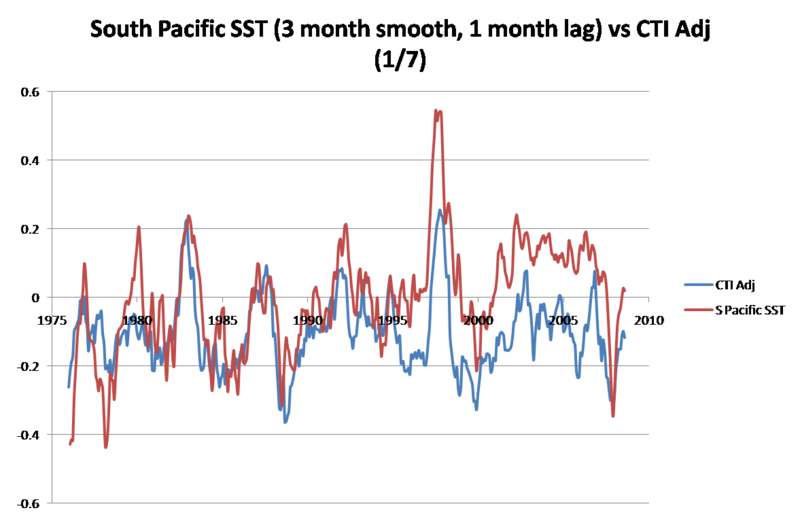 Or is the Indian Ocean merely maintaining a plateau of temperature created by the 97/98 El Nino? Your guess is as good as mine. However, it is very clear that the 86/87 and 97/98 El Ninos is responsible for temperature variation since the global climate shift in the 1976. Once again, the nature of the apparent variation in the South Pacific is clear, so I didn’t segment the ocean. 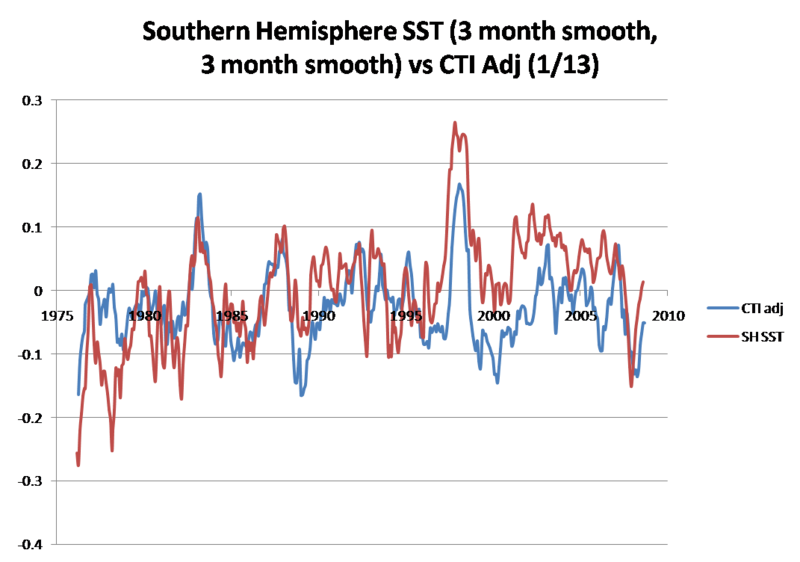 There is little ambiguity to SST variation in the South Pacific since the late 1960s. 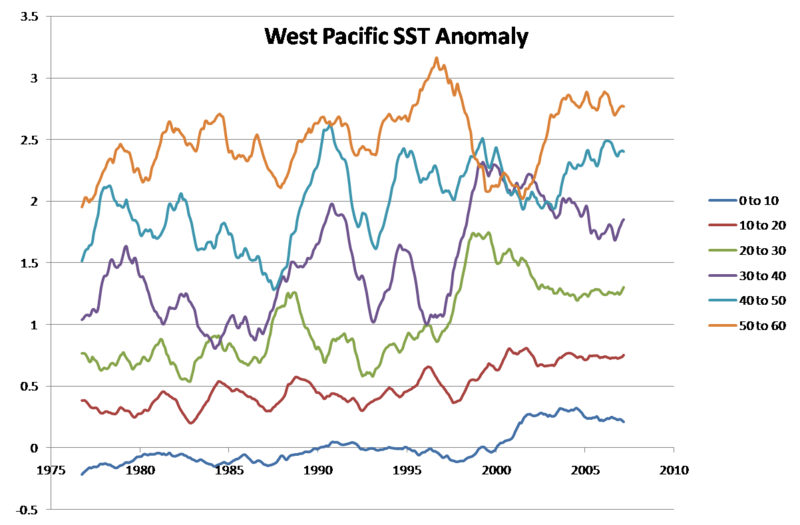 As you can see, the modern warming trend in the South Pacific consists of two step changes – one in the late 1970s and one in 1995 – and two steep warming periods that occured from 1931 until 1939 and from 1966 until 1972. The warming we have seen during the past four decades does not have suggest a constant increase in forcing, as would occur with enhanced greenhouse theory. Instead, the influence of step changes on the temperature record suggest that oceanic dynamics are being altered on occasion, leading to sustained increases in surface temperatures. It is important to note that after these step changes, temperatures are being held constant, unlike what we saw in the Indian Ocean and will soon see in the Pacific Ocean. I included the longer term graph because it is very illuminating. It is clear that since 1970, SSTA in the South Pacific have been dominated by SSTA in the Cold Tongue. However, during the ’40s, ’50s, and ’60s, this was not the case, as you can see. The above graph explains the context behind the breakdown in correlation during the three decades. The extremely long El Nino that began in 1939 and ended four years later may be responsible for the spike in SSTA that occured following the end of the El Nino. However, it is rather hard to explain. In a last ditch attempt to explain the variation in the South Pacific SST, I did what every curious climate blogger loves to do…. Besides the apparent correlation between the onset of Solar Cycle 21 and the global climate shift of the late ’70s, it is inclear whether the sun could explain some variation in SST. The step change in 1995 still remains unexplained. The increased temperature level has not progressively diminished over time, which would be expected from oceanic response to a strong El Nino. As I said before, the step change represents a fundamental change in the ocean that I can’t explain. While the causes of SST variation in the South Pacific remain unclear, the nature of the rise in temperature is not consistent with what would be expected from the enhanced greenhouse theory. An enhanced greenhouse effect would not be silent and only occasionally kick in with extreme strength. The North Pacific is heavily influenced by El Ninos, beyond their initial manifestation. The 82/83 El Nino, whose effects have not shown up in the other oceans (possibly due to the eruption of Mt. 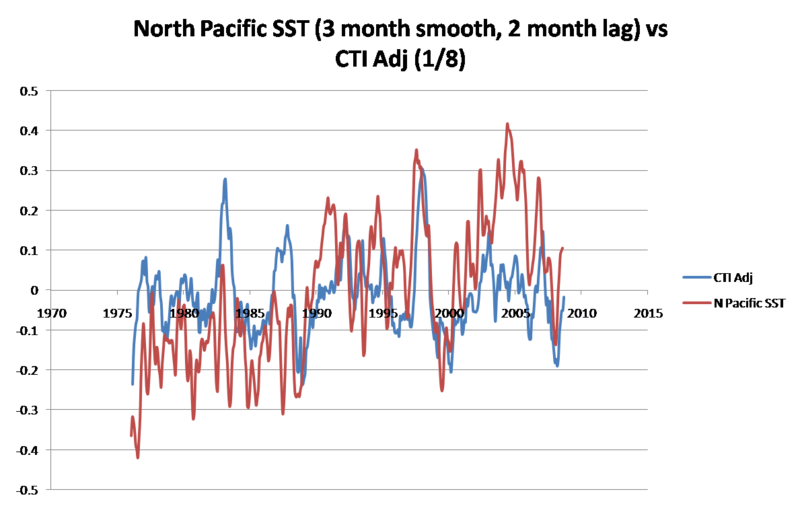 Pinatubo), causes a clear rise and fall in the ENSO-adjusted SST data during the years following it. 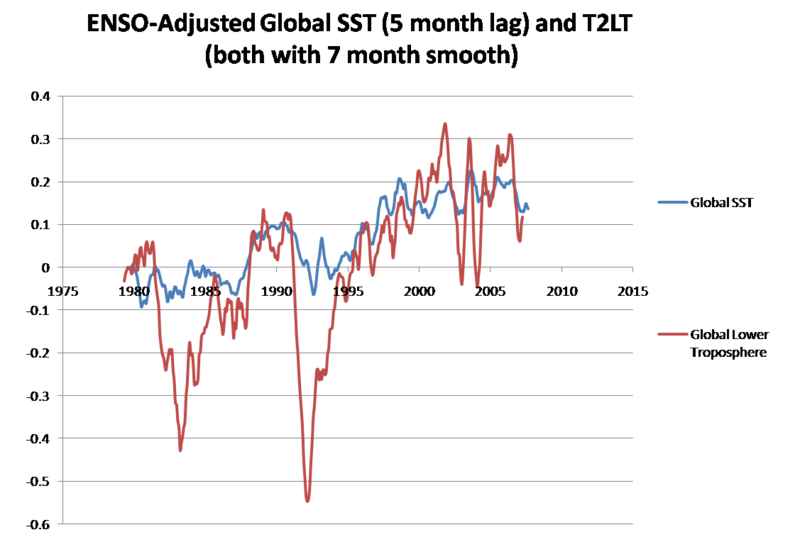 The 86/87 El Nino caused a much larger upswing and downswing in ENSO-adjusted SST. 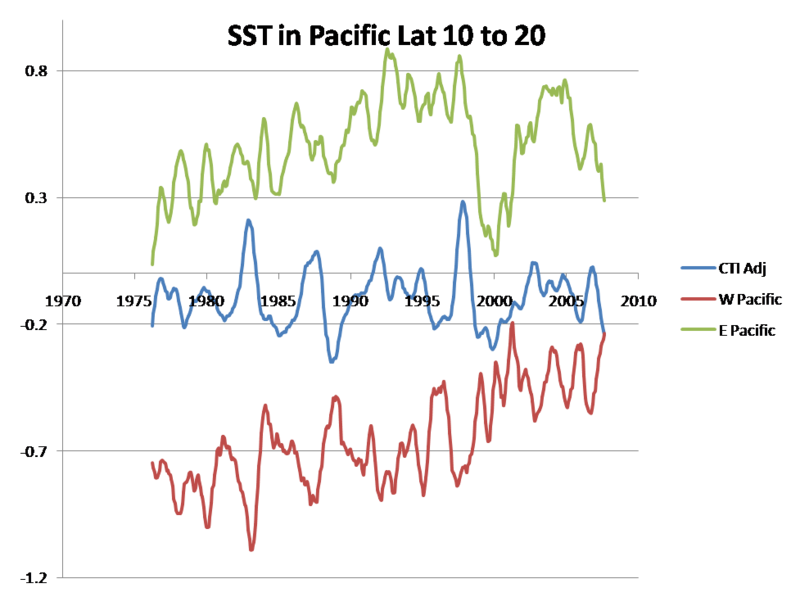 After the El Nino, SST remained at elevated levels, though this may have been due to the three small El Ninos of the early 1990s. Finally, over the past decade, we have seen the after-effects of the 97/98 as heat from the immense El Nino moved Northwards. Because of the complexity of the temperature record, I have broken the North Pacific up by latitude and by East and West. 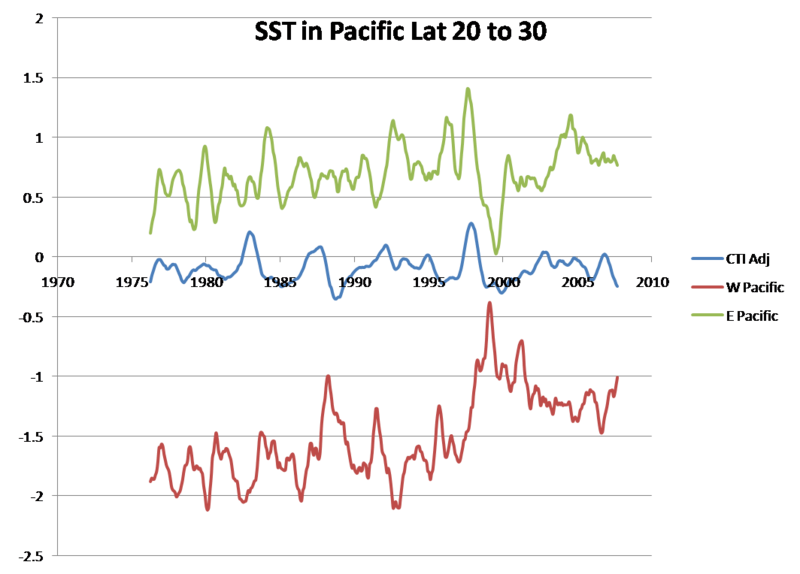 The chart below describes how the different segments of ocean react to El Nino events based on my graphs. The chart below describes how temperatures reacted to the 97/98 El Nino. My descriptions are obviously a simplification, so look to the graphs first to better understand regional variation. The charts and graphs speak for themselves, but I would like to point out that in the West Pacific from Latitude 0 to 40, the 97/98 El Nino caused a sustained increase in temperature. And throughout the North Pacific, the 86/87 El Nino had significant impact on temperatures. Keep in mind that from 1991 to 1995, Mt Pinatubo is known to have caused a significant fall in SST in the Northern Hemisphere. The South Atlantic shares no resemblance with SSTA in the Cold Tongue. Because the South Atlantic hasn’t warmed since the effect of the global climate shift on the region ended in the early 1980s, I won’t dedicate any time looking closesly at the variation. There are a few things we may be able to conclude from the graph. The effect of the global climate shift lasted into the early 1980s, like in the South Pacific. The 86/87 El Nino resulted in a step change in temperature that was sustained (once Mt. Pinatubo is considered). Temperatures began to rise around 1995, though since 1994, temperatures may have leveled out. 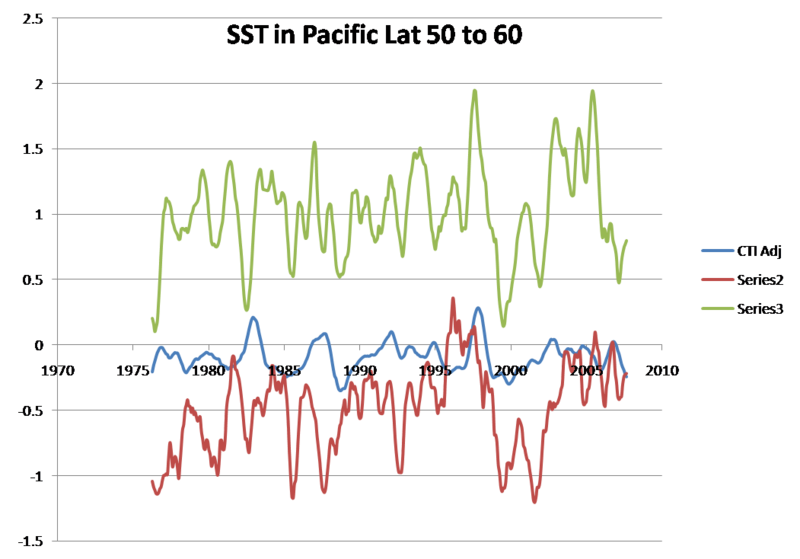 The graph illuminates the ocean’s response to the 97/98 El Nino. From Latitude 0 to 20, there appears to be a delayed response to the large El Nino, much like that seen in the North Pacific. From Latitude 20 to 40, the El Nino appears to have caused a step change, throwing the SSTA onto a pleateau. 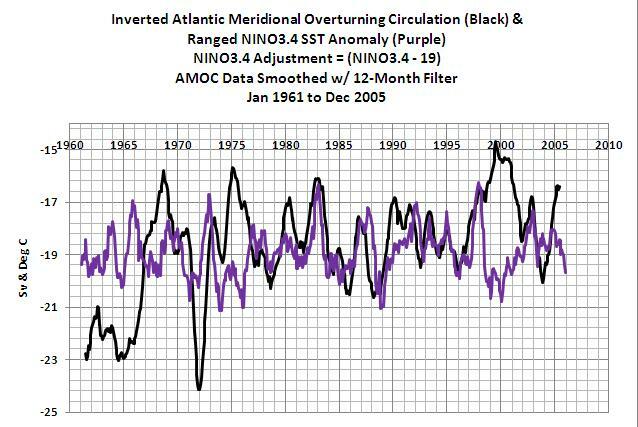 We often see this variation called the Atlantic Multidecadal Oscillation (AMO). I think that the effect of the 86/87 and 97/98 El Ninos on the AMO is obvious. 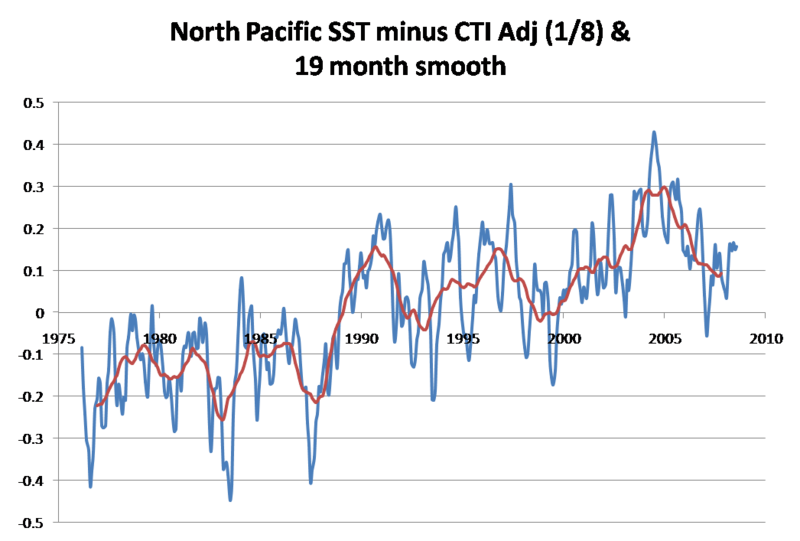 To add to the evidence that El Nino variability is effecting the North Atlantic, the Atlantic Meridional Overturning Circulation has been inversely correlated with ENSO since the global climate shift. Bob Tisdale explains this at his blog. I’m stealing his graph and presenting it below. 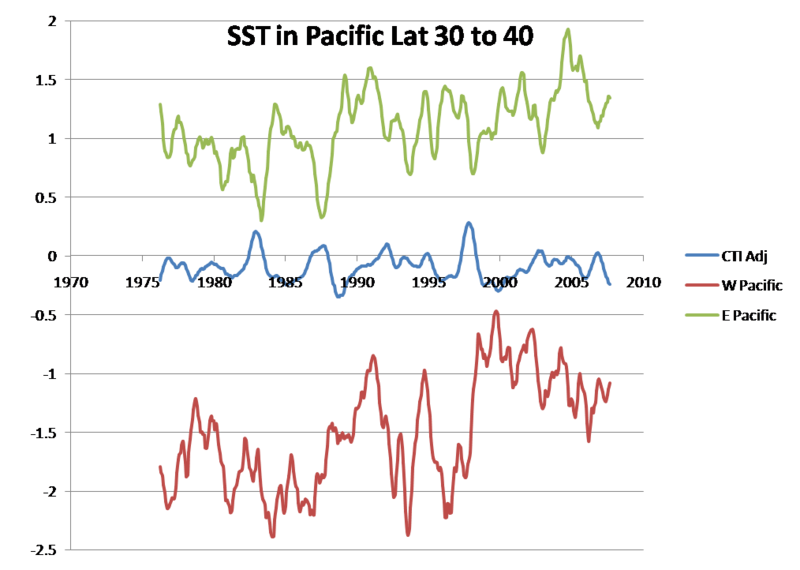 As you can see, even the Atlantic Meridional Overturning Circulation reacted strongly to the 97/98 El Nino after the immediate effects wore off, slowing down more than at any time on the chart. 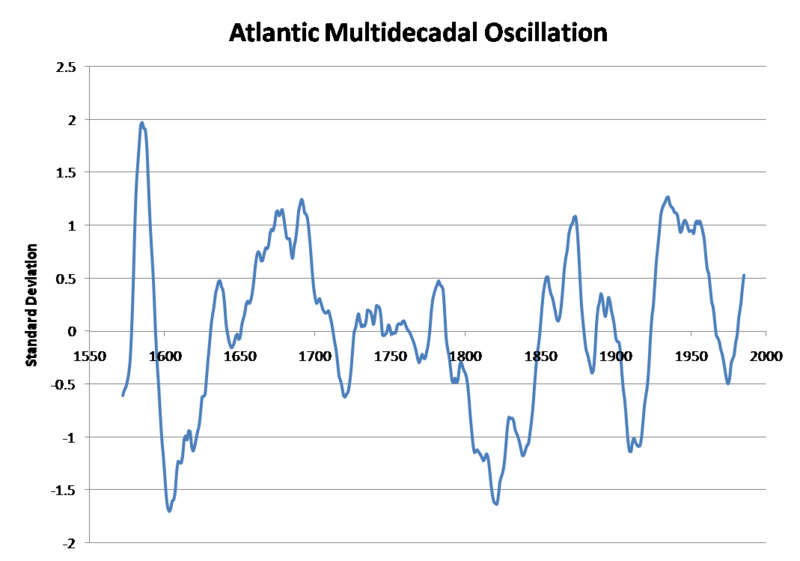 Also note the recent breakdown in correlation stating in 2005. The global climate shift of 1976 was most often characterized as the move from a negative Pacific Decadal Oscillation (PDO) to a positive one. Over the past few years, PDO has begun to go negative once again, and perhaps the Atlantic Meridional Overturning Circulation is falling out of phase with ENSO, like when the PDO was negative before the global climate shift. 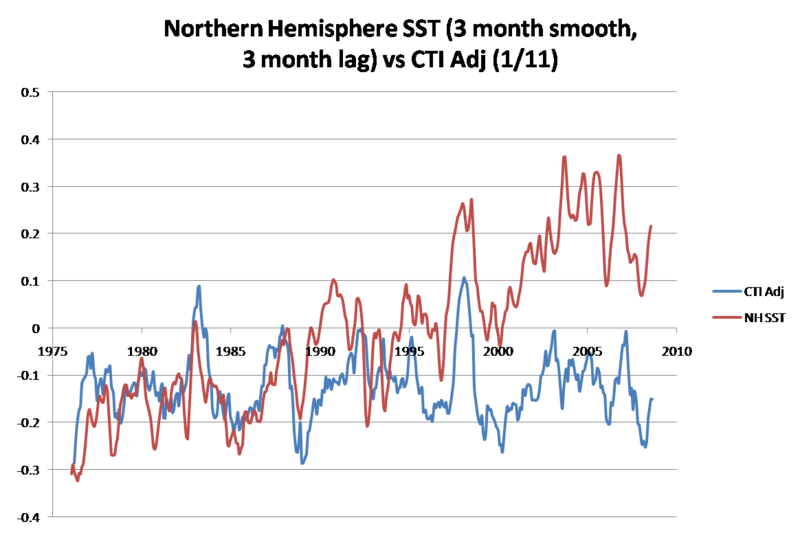 It is also important to note that North Atlantic SSTs fluctuate greatly, and that this recent rise is not unique in context, as shown by the graph below. 1. Indian and Pacific Ocean SSTA is characterized by two infuences: the immediate effect of ENSO events and the longer-lasting effects. 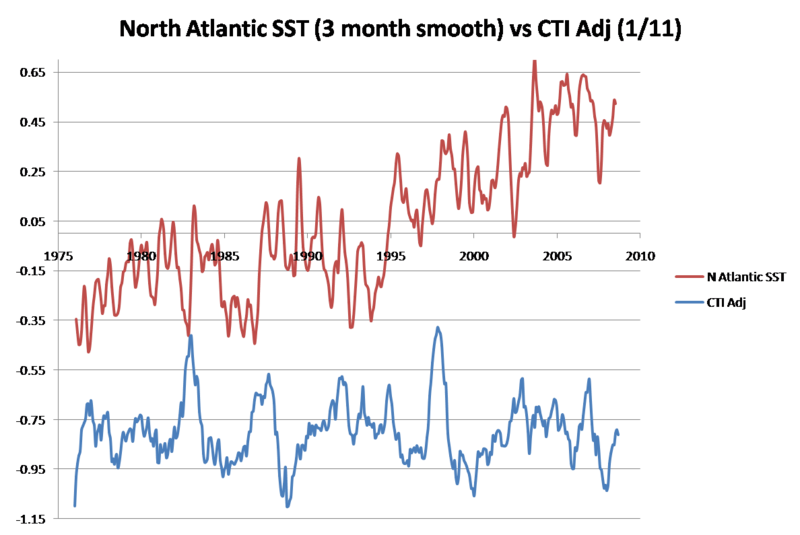 The two influential El Nino events occured in 1986/7 and 1997/8. The 1986/7 El Nino caused a step change in SSTA in the Indian Ocean, the North Pacific Ocean, and the North Atlantic. 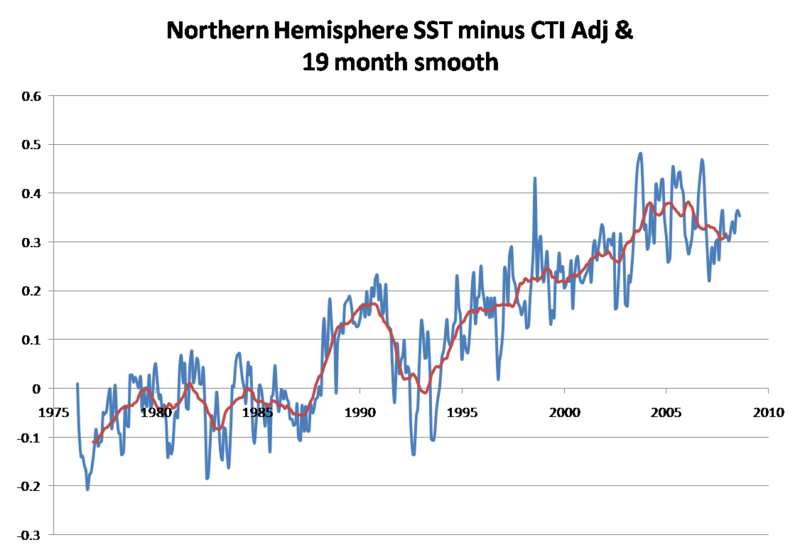 The 1997/8 El Nino caused a surge in temperature from Latitude 0 to 40 in the Pacific Ocean, caused a step change in the Indian Ocean, and likely also influenced the N Atlantic (as evidenced by the strong respons by the Atlantic Meridional Overturning Circulation). 2. Of all the oceans, the South Pacific best demonstrates variability that could not logically be explained through a linear (or logarithmic) increase in forcing. The alarmists need to explain how the supposed stronger greenhouse effect has completely missed the South Pacific. It is undeniable that there is no possible room in the SST record for enhanced greenhouse theory in that region. The greenhouse effect cannot discriminate between oceans. 3. This was a simple analysis. It may have been time consuming, but all it required was extracting data from a user-friendly website and some excel fancy-work to show that the effects of El Nino events are long-lasting and dominate the the global temperature record. How the alarmists miss something so easy to see is beyond me. 4. Global SSTA behavior is a composite of its parts. 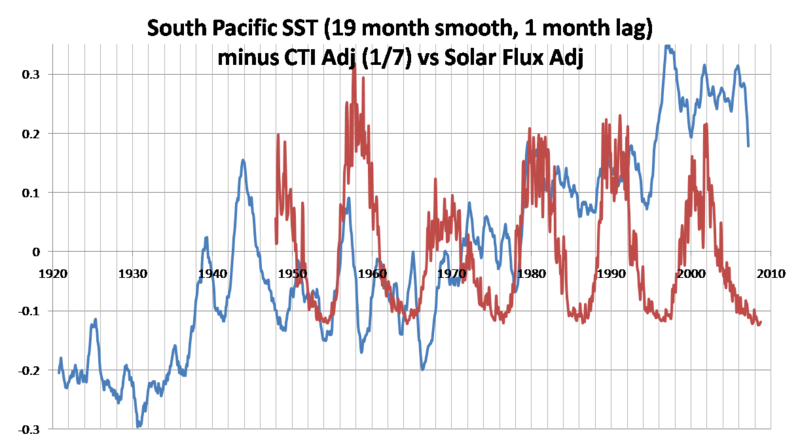 Temperature in the lower troposphere is merely a reflection of changes in global SSTA and volcanic eruptions, as shown in the graph below. Natural oceanic variation is the cause of possibly all modern warming. There are no unprecedented rises in any single ocean. Underneath ENSO noise, the oceans are not exhibiting warming that would be associated with a constant increase in forcing over a given time-span. Instead, the oceans are exhibiting step-changes and other long-term responses to El Ninos. This is a simple concept, demonstrated fairly easily. It is incredible that something so basic is missed by the climate community. Gray, S.T., et al.. 2004. 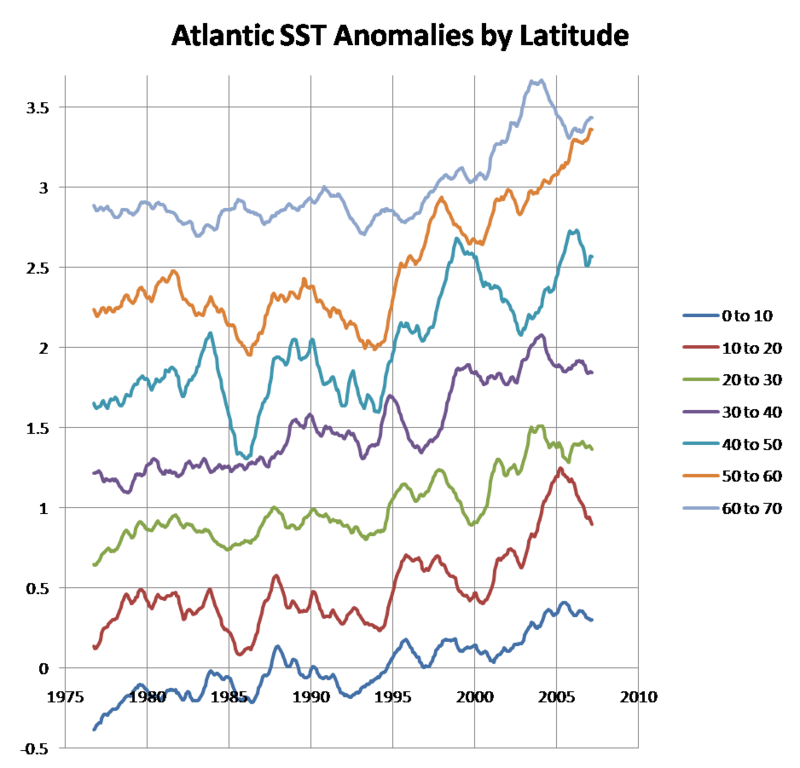 Atlantic Multidecadal Oscillation (AMO) Index Reconstruction. Carl: Great post. 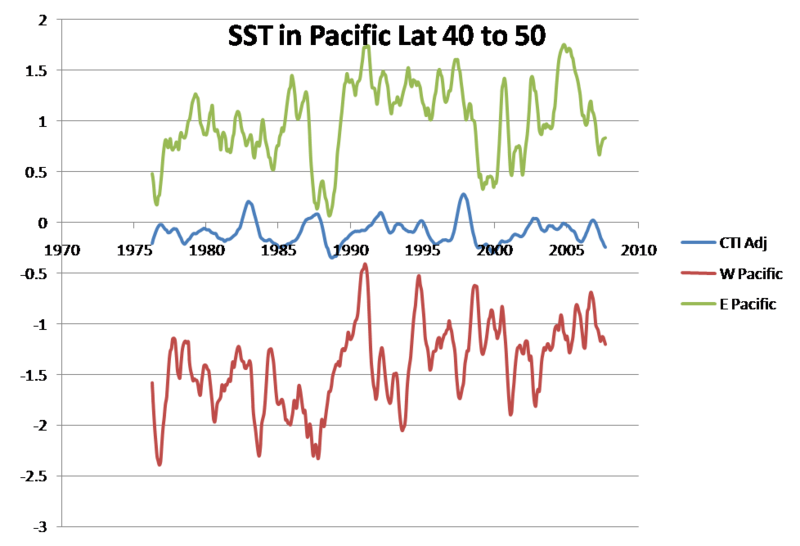 It looks like the CTI is the data set of choice for extracting ENSO effects. A couple of notes for you. 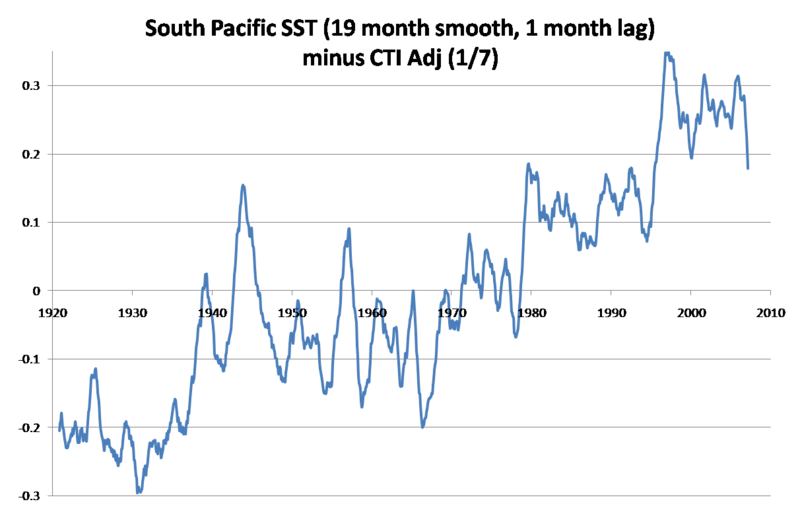 You included a comparison to solar for the adjusted Southern Pacific SST data. You might want to try that again with the adjusted Southern Hemisphere data. In looking at your graph of the Southern Hemisphere, there might be a better correlation between it and the solar data, at least in the post-2000 years. Thanks for your comment. I’m going to post soon on the SST by lat and long in the South Pacific, because it appears that the 1995 step change is actually a product of the aftereffects of the 86/87 El Nino being realized after being suppressed by Mt Pinatubo. Also, when I was looking at the South Pacific at various lats and longs, I noticed that the amount of month-to-month variability in the Southwest/central South Pacific has significantly decreased in magnitude after the 97/98 El Nino. It has also significantly cooled. I then looked at SST from where the Humboldt current draws its cold water from, and I found the same phenomenon. This phenomenon has occured in the past as well. Could heat drawn by the Humboldt current from the Southern Ocean be the supplier of heat for ENSO? Is this close to your idea of the role of the Southern Ocean? I noticed the same thing as you did about South Atlantic SST. When I find the time, I’ll break down the South Atlantic to try to find where the drop is most pronounced. On the same note of strange SST anomalies before the 97/98 El Nino, the West Pacific from lat 50 to 60 appears to be related the ENSO, 14 months before it, especially with the 97/98 El Nino. I’ll post up some more graphs when I have some time. Carl: At the end of the following post, I noted an oddity in Figure 12, an anomalous diagonal (SE to NW) feed across the South Pacific, from Cape Horn to the PWP. That’s what I’m looking at now as a possible avenue from the Atlantic. 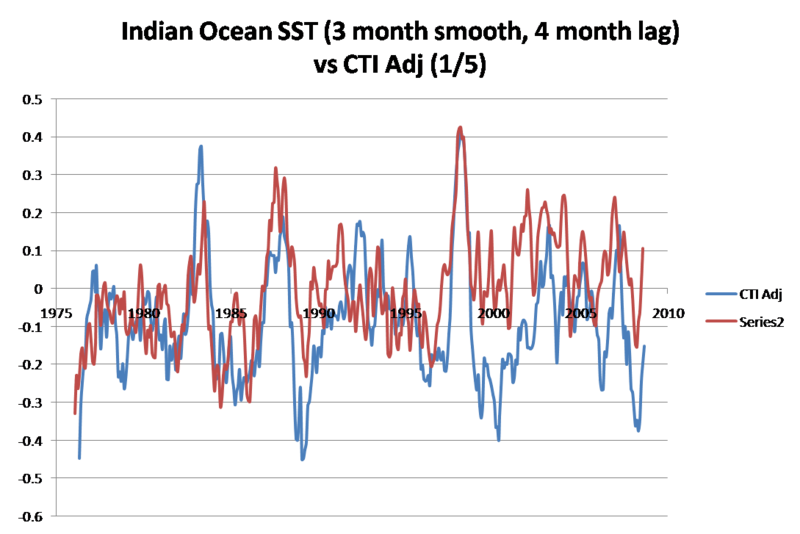 The Humboldt Current is a tough one to figure, at least it is for me with the noise it gets from ENSO. Refer to Figure 8 for a possible connection between Southern Ocean and Eastern Tropical Pacific. 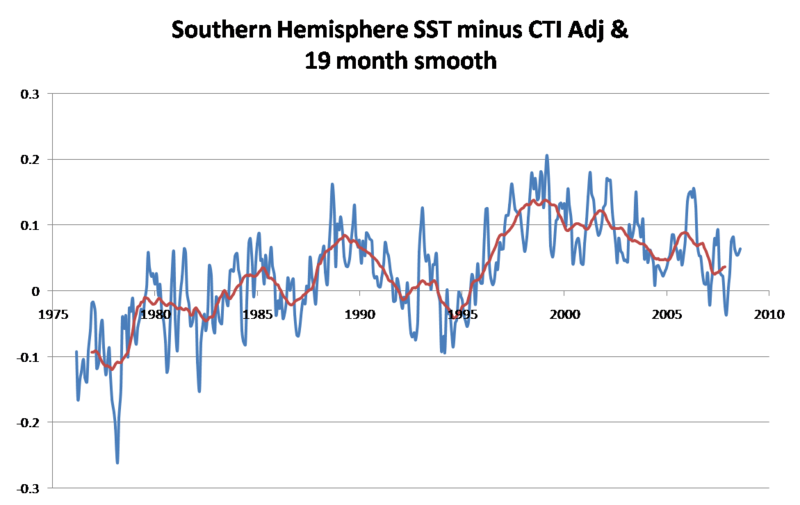 I’ve also got other comparisons between the Southern Ocean and NINO3.4, I believe. If I run across them, I’ll post a link.